This handsome fellow is hanging out on my deck. Last year at the end of the summer there was a whole fox family that would come up on my deck and drink the bird bath water. And I thought we had too many visiting cats for the safety of our birds! Great shot. Wow, great that you have them so close. Has he lost his right fore-paw? Regarding the question about the paw,the fox has all four paws but he was moving when I took the shot and the way it blurred did ended up looking like he might have been missing that paw. I think he is on tour. He crossed the road in front of me just Monday! And what a beauty. Thanks for sharing his loveliness with us all! Beautiful photo! What a moment! 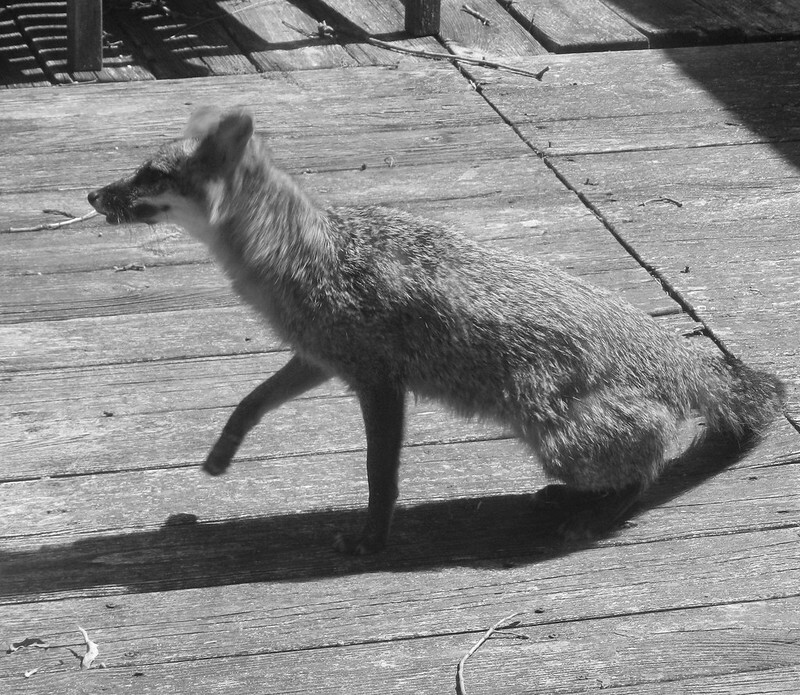 Wow, a fox visitor is surprising (for me). Wonderful black and white image of this beautiful fox!